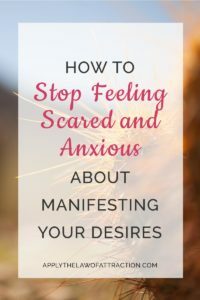 Looking over the comments and emails I've received lately, it appears nearly everyone feels scared and anxious about getting their desire. Whether it's caused by recent changes in planetary alignments or the approaching holiday season, fear and anxiety are certainly elevated. For many, it's more than doubt about whether the Law of Attraction is working. Some are afraid that they are creating their desire which is bringing up a lot of resistance. Some are worried and anxious that they will never attract their desire. It doesn't matter if you identify with one or all. We've all been there at some point. Fear and anxiety are normal. In fact, they're actually really, really good things to experience when using the Law of Attraction. Because they tell you that you have resistance and limiting beliefs. Once you know you have them, you can start destroying and uncreating everything that is holding you back, thus allowing your desire to come to you. And, most importantly, allowing you to keep your desire because if you don't eliminate the resistance and limiting beliefs, your vibrational alignment can easily shift, allowing your desire to slip through your fingers and pass out of your life as quickly as you received it. Any stories of people who won the lotto and later went up bankrupt come to mind after reading that? They got what they wanted, but their resistance and limiting beliefs didn't allow them to keep it. Let's create a better outcome for you. Begin by awakening from the dream of identifying with being scared and anxious. You are not your fears. You are not your worries. You are not your anxiety. You don't need to doubt whether the Law of Attraction is working. Trust that it is. Trust that your life is unfolding exactly as you desire. The Law of Attraction is working at all times in every situation. The Law of Attraction is creating the reality you are telling it to create with your thoughts and feelings. It doesn't matter what anyone else does, says, thinks, believes, or feels. You are the sole creator of your reality. I want you to understand that you have the potential to change. Any fear or anxiety you experience is a sign of unresolved problems – perhaps something happened in your childhood that is affecting you today, maybe you aren't willing to realize how absolutely wonderful you are… Whatever it is, you can choose to change. But you have to be willing to change. You need to have some insight into what is causing the fear and anxiety, i.e., what your resistance and/or limiting belief stems from. Once you identify the cause, you can eliminate it. You might be confused at first when you undertake great change. For instance, if you're looking to resolve a major issue, you might have to alter how you perceive yourself and others. You might be tempted to act from old habits that no longer come naturally to you. Allow yourself as much time as you need to process and assimilate the changes. I highly recommend EFT to help you eliminate the fear and anxiety quickly and easily. It's super easy to learn with The Tapping Solution: A Revolutionary System for Stress-Free Living. For example, instead of writing, “I'm scared I'm messing up,” write “He/She is scared (s)he's messing up.” This will help to shift the emotions, allowing you to be more neutral and at peace. You will reach a point where you are able to stay positive no matter how negative things may be around you. When it happens, your life will become utterly effortless and joy-filled. You will be amazed at how your reality transforms to match your desires. When Was the Last Time You Threw a Pie in Someone’s Face? Hi Meg – It sounds like you probably still have a lot of resistance and attachment to the outcome. Once you resolve your resistance and let go, you should see your fears disappear. There are various articles and methods on this site to help you resolve your resistance. Other techniques might help you more than what you’ve been using. You might also consider working with an EFT practitioner or other specialist to help you pinpoint what is actually causing your fear and resistance that you haven’t yet identified. Once you get to the root of the problem, you should be able to resolve the cause quickly. I strongly suspect a portion of your problem stems from your focus on the other woman which is causing a lot of your anxiety. Per the Law of Attraction, the anxiety and thoughts about her are only continuing to create her in your life as someone you see as an obstacle. It’s a self-perpetuating cycle where you create your own stress and worry, and that stress and worry creates what you don’t want. The fact that she bothers you so much is another sign that you haven’t let go. Also, part of the difficulties you describe stem from things like “I want a wonderful romantic relationship with J, I would like to be happy even if that means my life is without him.” What you’re creating is wanting a relationship with him, not having the relationship. You’re creating wanting to be happy, not being happy. Your wording is even specifying that he isn’t in your life. I recommend you reread my book for more insight into why the affirmations you’re using are actually working against you to create what you don’t want. I am new to your website & I have navigated through some of the different topics you have posted about & how to make things go my way. I am a signle parent of 2 kids & I have left their dad when I was pregnant with my 2nd child. Since then i have created a vision board with all aspects of my life & everything is going incredibly well. I am madly in love & have met my soul mate since we are very happy & the relationship between us & between the kids & my partner is going incredibly well. We are taking things slowly, but moving in the right direction. Where I am struggling is with my ex – who is the kids dad. He is a very negative, manipulativee & controling person & extremely nasty towards me & has been to the kids. What I have been trying to get is him basically disappearing from our lives as he has such a negative impact on my kids which are so young (4 &2). Bearing in mind that he was never around & did anything as a family it was always me & my kids & the kids dont ask for him. What am I doing wrong? How am I going to effectively eliminate him from our lives? this has been an ongoing struggle every other aspect in my life is fantastic. Hi Jessica – Remember that with the Law of Attraction you choose what you create with your thoughts and your feelings. If you want to change what you’re creating, the change begins with you. As you focus on all of the problems with your ex and everything you dislike about him, you create more of it. As you oppose something, you only create more of it. Per the Law of Attraction, you should focus on how you want things to be and live as if they are already that way. Try seeing the good things about your ex, remember the good times you had together, as this will allow you to begin to create more positive energy and thus draw more positive experiences to you. Its me again! I finally found a solution to fight off resistance! I got it under control! Here is what I did. Yesterday I saw a beautiful track that I really want and need, so I went home, I wrote motivational quotes about getting it and visualized driving it, also made a drawing of it. I felt wonderful. Why resisting it and have fear about it? I am certain 1000% it is going to be mine very soon in a miraculous way. It is so stupid to resist it… And then it hit me! This is what i should have done with my guy. I decided i am only going to have good, positive thoughts, no more fear and I am certain I will have exactly what I have envisioned! I am keeping the same feelings, excitement and vibration of the car. What do you think? i think i may be getting there, lol…..
Great insight Gianna! Keep up the good work! I have a question, if I’m trying to manifest love with a specific person but we had previously had verbal arguments/fights via texts, should I erase/delete all those negative texts? Could that be holding me back from manifesting positive communication with him? If they still bother you, they could be affecting things. However, the problem probably is also connected to resistance and/or limiting beliefs you need to clear. There are various articles on this site that can help you with that. OK please direct me to those articles 🙂 I also read your book and am working on getting my specific person back(which i have attracted him back before, i can do it again 😉 )! Thank you so much because many have told me that I couldn’t .. I already moved back to my native country, in order for us to be together (had to be done obviously) and he has already asked to see me in person many times. (he lives in a different city). The problem is still my fears, doubts, insecurities, thoughts about his relationship (if he has any). I am visualizing him and manifesting him constantly ( walking in the streets, being together etc ) but my fears keep creeping up…Do I take the leap of faith and meet him no matter what, and in the meantime try to fight my resistance and frustrations? Thank you so much for everything…. Hi Gianna – You’re having a lot of successes, so keep reminding yourself of that when you become discouraged. Instead of fighting your resistance, it’s better to resolve the root issue. You might consider trying EFT or the Releasing Technique. I have a big exam for my university in 6 months. All I want is to be the FIRST person in that exam! You know, I have a fear of THE TIME THEY RELEASE THE EXAM MARKS AND I’M NOT IN THE FIRST PLACE. Please help me, This exam is going to change my life; It’s between all of students in my country 🙁 . Hello Elizabeth, Happy Holidays and Happy New Year! So, I moved back to my country and we spoke on the phone already 3 times. Hi Gianna – Again, you really need to focus on getting rid of your resistance. You want to create a relationship with him, and when you begin to, you aren’t allowing it to happen. If you want him in your life, you have to allow him in your life. If you want to be with him, you have to be willing to see him. Stop resisting and start allowing. Do the techniques I’ve referred you to before. I emailed you before regarding my dilema, you helped me then, I was hopng you could guide me once again and help me where I have gone wrong. I have purchase your book and read it few times to absorb it. I am trying my utmost best to remain poisitve, but it’s a struggle for me at the moment. I feel an intense hurt that just won’t go, no matter how hard I try, visulize or meditate. The man I’m in love with ‘R’ has become very emotionally cold and distant towards me, he hardly textes me anymore and when he does text me, it is with no affection or kind words, which has made me more intense or desperate. The same girl I wrote to you about initially, (who works in the office, and is much younger than R and I) has pursued ‘R’ relentlessly, the only difference being is that she is married and living with her husband and child. R talks/texts her more than me, that much I do know for sure, as she makes derogatory remarks in the office. ‘R’ and mine relationship is a long distant one, meaning he lives 250 miles away from me, I’m not sure if he is seeing he girl in the office or has found someone closer to where he lives and is in a relationship with her. I have asked him, if he is seeing anyone, he does not give me a straight answer but instead becomes angry with me. In your expert opinion have I done anything to push him away if so Is there anything I can do applying LOA to bring him back to me. I appreciate your time and patience and any guidence you can give me. Veryn quickly and breifly I forgot to add that I cannot seem to take it out of my mind that he is in fact seeing someone. I would like very much to stop that using LOA, is there any way how I am able to do that? You already know your thoughts and feelings have the power to create. Only you can create what happens in your world. If you want to change what is going on in your world, you need to change. It can be as simple as picking something better to think about minute by minute or listening to music you enjoy. I took your advice and said that there is a possibility that we meet. Well, he has cooled off. We speak on the phone maybe once a week, but we don’t text. We email only every other day. And today he said again “of course he would like to see me if i want it also” and he likes “learning my news” . I think he is slipping off, or it’s my paranoia speaking. if you offered a course, I would be the first to sign up, because I need it!! I don’t want to be person he talks to, because I am interesting, or to learn my news, but because he cares. I visualize about him all day long and at night, but I also have fights with him, in the middle of this, or i am afraid it is not going so well. I feel he cares deeply about me but I need to do something before its too late. I dont know anything about other women, I am not snooping around, because I am saying “this is all about me”. I will try visualizing harder with feelings of love with detachment at the same time. Is it me? Should i focus on something else? am i pushing him away still talking to him? Gianna – My advice is the same as I have to told you several times in the past. Follow the tips in this article and in the article on resistance. Change begins with you taking action to clear your resistance, your fear, your doubts, etc. As I told you, I have a big exam that is going to really really really create my life! At first, I laughed at him in my mind and thought “Oh! What a negative person!” But at home, his sentences remembered and I’ve got a very bad stress again. I have an older friend that who told me something about LOA. He was like me! When he had 6 months to this exam (University Entrance) he watched “Secret” and started to use it and guess what??? Now he is studying in Stanford University (We are from Iran). Except this, I remember a lot of things that came to me (Negative’s More!) just by thinking and feeling without knowing it! I have read this article, but it was for grades! I think you can’t imagine how big is this exam! Because it’s like that just in my country! Should we visualize just one scene or aspect of our dream??? For example: Should we visualize JUST we are driving that car or we can have some? Like visualizing we are parking it, we are washing it!, we are seeing our car in the parking? I mean, any visualizing that give us the feeling of having that thing or dream, are allowed or we have limitation? You can do it all. There are no limitations on what you can visualize. The article I suggested isn’t just for grades. It also covers exams. I suggest you reread it and apply it. You were right; I read it again and I’m going to use it. Hi Elizabeth, i think I owed you at least to let you know we met. I thought it went great, we were friendly and civilized. No fights..we didnt say much either, except for the fact that he wants to see me again, he said. I came back home and added him on facebook, since i deleted him long time ago. I clearly see he is still talking or “dating” the same person. She is long distance, i dont know how often they meet, but he told me recently he has no personal life. The crazy thing I want to mention is that i had created a VISION BOARD a long time ago, with a random street in his neighborhood, since i dont know where he lives..I ended up passing by the street on my vision board, TWICE! out of pure coincidence! Now i know all this, is working out!! Hi Gianna, It’s wonderful you met. It’s up to you as to what you want to do. Do you want to move on or do you want to be in a relationship with him? Do you want to be friends or do you want to cut him out of your life? You need to get clear on what you want and then manifest it. I really want a relationship with him. Since he is “seeing” someone, i figured now is the time to practice Law of Detachment and Law of Allowing. I have been obsessing on this -and him, for too long, I just have to let go now, and focus on something else…it has happened before, the minute I let go, things manifested immediately, so I really want to try this now, since i am trying too hard on the border of desperation…Do you agree with me? Detachment is always a key part of manifesting. You have to stop feeling scared and anxious – stop being desperate and obsessed – if you want success with the Law of Attraction. This is why I have to focus on something else..since I added him on facebook (mistake) i have to constantly see at all his posts of mow much he loves his girlfriend. This is not something i want to see, feel, think on a daily basis. It seems what i feared the most manifested. Espeically after I came back from seeing him. It seems like total disrespect on his part, to belittle me…Another guy is interested in me, but I really dont like him at all and we have nothing in common…i just have to keep trying harder…what do you think? I suggest you reread my book and follow the steps in it again if you do want to manifest a relationship with him. It will help you know what you should focus on. Thank you Elizabeth from the bottom of my heart for everything you have done for all of us here. I just realized that I have no control over this, absolutely none, so i decided to let go. I just manifested a great car, under the most unlikely circumstances and i decided to follow the same path. I will let go, use to law of Detachment, and put my complete trust in the Universe (God) that he will manifest what I absolutely desire at the end. I just got tired of feeling this fear and doubt for a long time, so I will take this path!! And I am confident all my dreams will come true as they have! Thank you so much again! Wonderful Gianna! That’s the absolutely perfect path to take. Whenever using the Law of Attraction, you have to let go and trust that what you want is coming to you. That’s what allowing is. As you remember in my book, I said it can be the hardest step, but it sounds like you’ve finally stopped resisting and have figured out how to let go. Well done! Hi Elizabeth, I have a crush on a guy who work at a shopping mall which located near by my house. But I didn’t see him often. Since i try to attract him using LOA I see him almost everyday. Is that a sign? Mona – You can learn more about signs here: Ultimate Guide to Signs that Your Desire is Manifesting. In the meantime, stop feeling so scared and anxious about whether something is a sign. Be grateful that you’re seeing him. I tried EFT, and I couldn’t really get into it. So, now I want to try the other option you mention, journaling. My question is, it seems like it might be counterproductive with the Law of Attraction? Me writing down all my fears over and over keeps me concentrated on them and attracting more? Or am I understanding the process incorrectly? That’s why I suggest writing in the third person. It helps you detach from the fear. You aren’t associating the fears with yourself; you’re shifting them. Thanks, I’ll keep trying it then. I have a question. So I purchased the book and do the techniques. And now to the letting go part. I feel okay without being with him. I go out, do my things, etc. What bothers me is that I miss him much. I cried missing him, thats all. Im not mad or angry or dissapointed, I just miss him. Any suggestion how to overcome this feeling? I finally tried EFT yesterday and it was absolutely amazing. Thank you!